Last weekend saw the launch of our pick and mix cart! We are very proud of our new addition and there are lots of new food Victorian style carts on their way. 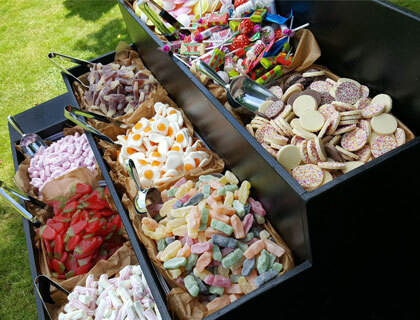 Our standard cart comes with 9 options for different sweets, they had fizzy cola bottles, chocolate discs both white and milk chocolate, fried eggs, jelly babies, a mix of different swizzels sweets like drumsticks and parma violets, flying saucers, flumps, shrimps and my favourite giant strawbs! We aim to offer something unique and different for events and with all of our carts and stalls made by us you can be sure that they really are that. All of our stalls match and go together so you can mix and match anything you like from our site. We usually provide approximately 25 kilos of sweets which will provide a good amount for up to 150-170 people. We can of course cater for bigger parties, just let us know how many and we will organise plenty more supplies. The cart is available with or with out and operator who will make sure the cart is topped up and looking its best for you guests. We are hoping to add some more picture here soon and might even add a roof to the cart and some lights as well.